One reason why the series Lucifer has such a big success in Germany is surely beside the acting of Tom Ellis also the German dub version. Compared to other series, there is a marked similarity between the German voice and the English original. Therefore we are happy to present you Lucifer in persona by Tom Ellis and the actor who gives the devil his German voice. 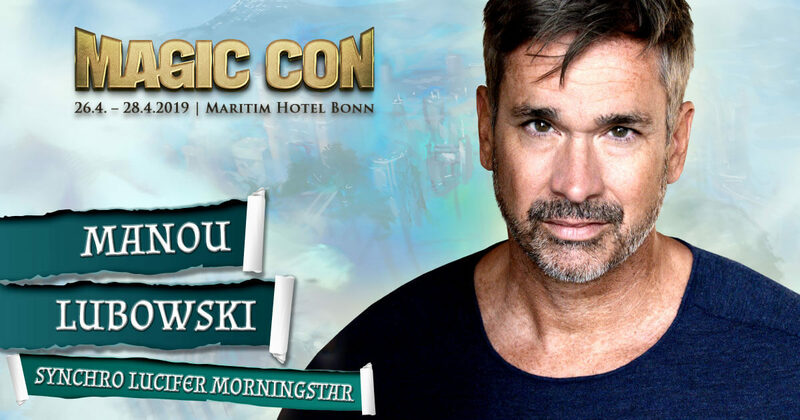 Manou Lubowski comes to MagicCon 3. And for the first time he will speak for you on your voicemail, leave greetings or send a text message to someone in your name. Don’t miss this unique opportunity to receive Lucifer’s calls. If you have a text of your choice, print it out in a legible font and bring it with you, otherwise Manou will come up with something delightfully insinuating in Lucifer Morningstar manner. Manou Lubowski, born in Munich, started working as a speaker during his childhood. One of his first roles, which he still occupies, is that of Willi Sauerlich in the radio play series TKKG. Lubowski also made a name for himself early on as a dubbing artist for film and television, and has been involved in countless productions to this day. Among others Manou Lubowski could be heard as Hassan in the children’s series Sindbad, as Marco in the series Marco, as German voice for David Tennant as Bary Crouch Jr. in Harry Potter and the Goblet of Fire or in famous series like Lucifer as Lucifer Morningstar, Game of Thrones as Jamie Lannister, Beverly Hills as Steve Sanders. He also embodies Lightning McQueen in Disney’s Pixar Cars. As an actor Manou is successful in various formats. His numerous television roles include series such as Küstenwache Forsthaus Falkenau, Das Jesus Video, Add a friend, der PsychoPate, Dr. Klein and Pastewka. In the cinema he is known from films such as Jerry Cotton, Der Feuervogel, Schutzengel, Buddy or Hot Dog. Manou Lubowski will be on stage on Friday 26.04.2019 at 18:30 in the Saal Beethoven. For autograph sessions and the possibility to discuss your answering machine, please refer to the information at the con.